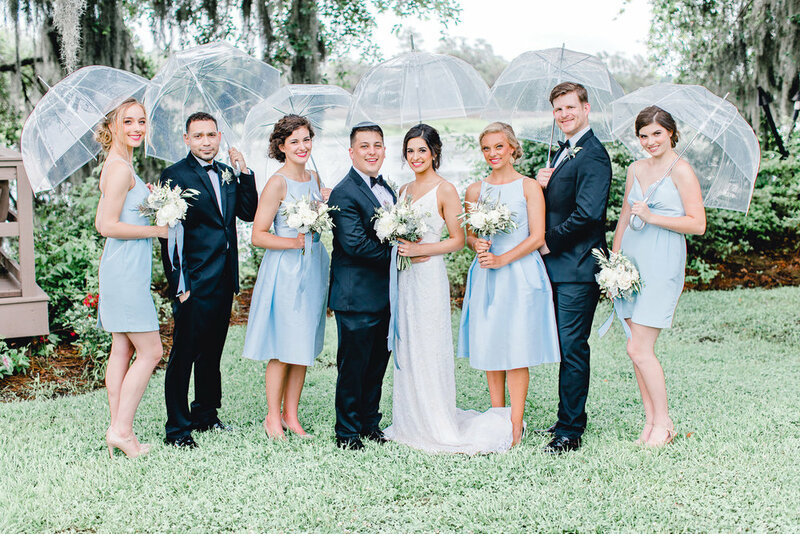 This lively styled shoot wasn't just a way for a group of Charleston vendors to show off their talents--it was a celebration of all things Southern! Photographer Emma Allen of Emma Lili Photography and coordinator Heather West from Carolina Occasions wanted their festive dusty blue wedding styled shoot to showcase their favorite things about living in this corner of the U.S., from the towering oak trees of Magnolia Plantation to the unique traditions held dearly here. "[We included] the southern tradition of burying a bottle of Bourbon upside down to avoid rain at your ceremony site the day of. Although, we did get some rain, it did not downpour at the time of the shoot as expected!" says photographer Emma Allen. Perhaps the tradition works! The "everything Southern" theme continued into the menu, which boasted country favorites chicken and waffles. And, remembers Emma, "Even the favors incorporated something Southern: grits."